Contact: Frederick A. Cook Jr.
North Las Vegas, NV – 11 September 2017: Mr. Currie is a highly experienced senior executive with 30 years’ experience in the electronic entertainment sector, with 20 of those years in regulated gaming. His experience spans gaming machine design and manufacture, as well as the design and manufacture of peripheral gaming quipment. Mr. Currie was the founding president of WMS Gaming, held senior executive positions with Coin Mechanisms and Game Mechanisms, and was the president of Elite Gaming Technologies. Mr. Currie received his MBA in International Business from Roosevelt University in Chicago, IL; and also retired as a Major from the US Army Reserve where he held command and staff positions in two Special Forces Groups. 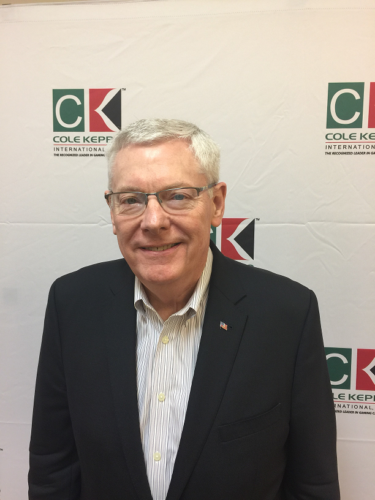 In the newly created position of President, Mr. Currie will report directly to Frederick A. Cook Jr, the Chief Executive Officer of Cole Kepro International, and will join the company’s management committee. ABOUT COLE KEPRO INTERNATIONAL, LLC. – Cole Kepro International, LLC is a North Las Vegas-based designer, developer and manufacturer of high performance slot machine cabinets, kiosks, and other metal fabricated products and associated peripherals. With manufacturing facilities in North Las Vegas, Texas, Taiwan, and Mexico, CKI offers a full range of services to all its customers with an emphasis on quality and value. Cole Kepro International is the industry leader in gaming cabinets.